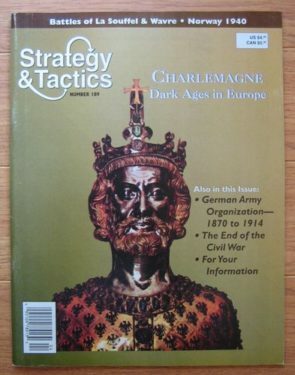 Charlemagne is a magazine game for two players by Joe Miranda. It simulates the political and military struggles in Europe during the reign of Charlemagne, often called the founder of Europe. The game takes a pretty unique approach: one player takes the position of the Frankish Empire while the other player controls all the tribes and kingdoms at war with it. Wich kingdoms these are changes often, because random events determine if regions stay neutral or become enemy to the Franks, meaning that the tribal player will lose control over some of his forces and gain conrol over others every turn. Different to the Frankish player, the tribes cannot combine their forces, but will always fight for themselves, wich adds to the chaos and allows the Frankish player to control bigger armies, wich are of course harder to maintain. Charlemagne gains points for controlling regions, converting tribes to Christianity, founding cultural centres and controlling castles. So the tribal player has to follow the strategy of permanent raids, pillaging and destabilization. The massive chaos prevents both players from long term strategies. Not many intersting decisions are possible: The tribal player attacks weak castles and tries to destroy them. As a reaction, a strong Fankish army will try to extinguish the fire by killing the raiders. The only question is if the Franks find the time to expand their empire, and invest in cultural centres, or if they are kept busy by the tribes. Sadly, players have only little influence on this, because rebellions are triggered by random events, so there can be up to three rebellions in a turn turn or none. It also makes a big difference if the tribal player controls the powerful army of Lombardy or a few angry farmers in Asturia. This game could be a fun chaotic ride anyway, if it would be over after two hours, but it takes more about 8 hours, wich is definitely too long. 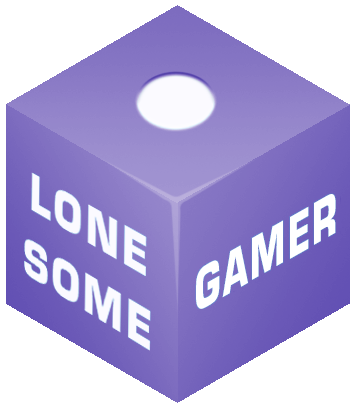 You can see my playthrough here.